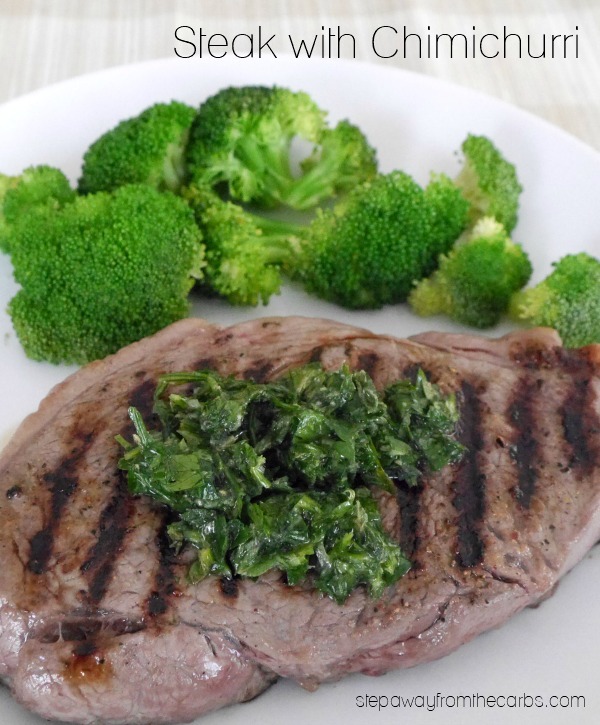 This steak with chimichurri is an easy low carb way to adorn your favorite meat! It seems to be all or nothing when it comes to me and herbs. One minute they’re all dying on me, usually thanks to bug attacks but occasionally due to lack of water! On other occasions they’re growing so much that they’re coming into flower and taking over! Chimichurri is a herby sauce from Argentina that typically includes parsley, oregano, garlic, olive oil and vinegar. Although parsley and oregano are the traditional herb choices, I’d recommend trying it with whatever fresh herbs you have available. 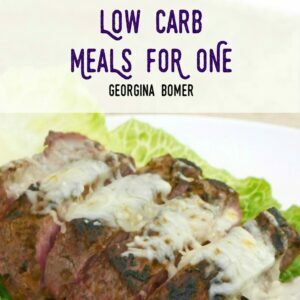 I’ve tried it with cilantro, basil, and chives – and it worked perfectly! 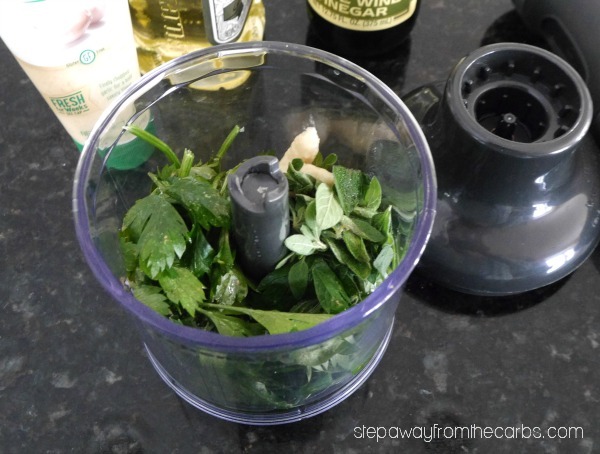 Add a large handful of each herb to a blender (I use the attachment of my stick blender). I’m absolutely convinced that the exact quantities really don’t matter with this. Any combination is worth trying! To the herbs add olive oil, white wine vinegar, and garlic paste. Whizz it up in the blender, adding a touch more olive oil as needed to help the mixture blend. Taste for seasoning and add salt and black pepper as desired. Then scrape all the herby goodness into a bowl and keep it covered in the fridge until needed. I *love* being able to prepare elements of the evening meal in advance as I often have more energy during the day! 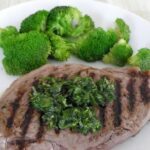 To prepare the meal, cook the steak on a grill or griddle pan with some seasoning, then serve it with a spoonful of the chimichurri over the top. Oh, and you might want to check out Omaha Steaks for amazing deals on steaks and more! 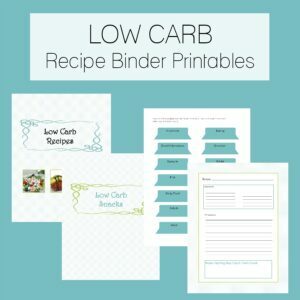 This recipe makes between two and three servings, depending on the herbs used. 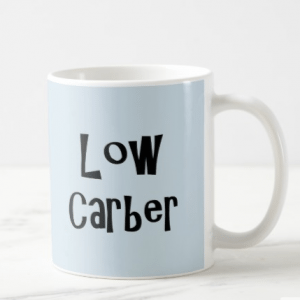 But it is pretty much zero carb so you can go big when it comes to serving size! The herbs taste sooo fresh and vibrant, and the white vinegar makes everything slightly zingy. This would work on all kinds of meat and fish! To make the chimichurri, add everything apart from the salt and black pepper to a small food processor and process until a thick paste has formed. Taste for seasoning and add salt and pepper if necessary, or more oil if needed for blending. Season the steak and cook it on a grill or griddle pan. Serve with a large spoonful of chimichurri over the top.